Yimiton's Blog: How tragic! 8-year-old girl dies after sustaining internal bleeding on her wedding night to a 40 year old man. How tragic! 8-year-old girl dies after sustaining internal bleeding on her wedding night to a 40 year old man. This is so sad. I mean, seriously, why will these men prefer to marry children and not women of their age or at least mature enough to be wives and take on the responsibilities of being wives and why will these children's family be so mean that they'll be willing to sell off their daughters to these perverts? An 8-year-old girl identified only as “Rawan,” died following internal injuries she sustained on her wedding night. The young girl was forced into married to a groom who is reportedly about 40 years old. Rawan died in Hardh, an area which borders Saudi Arabia, after internal bleeding could not be controlled. International rights activists and bloggers are calling for this groom and child’s family to be arrested following this horrible incident, citing that arrests and other consequences could help to make the practice obsolete. Yemen's gripping poverty plays a role in hindering efforts to stamp out the practice, as poor families find themselves unable to say no to 'bride-prices' that can be hundreds of dollars for their daughters. More than a quarter of Yemen's females marry before age 15, according to a report in 2010 by the Social Affairs Ministry. Tribal custom also plays a role, including the belief that a young bride can be shaped into an obedient wife, bear more children and be kept away from temptation. In September 2010, a 12-year-old Yemeni child-bride died after struggling for three days in labour to give birth, a local human rights organisation said. 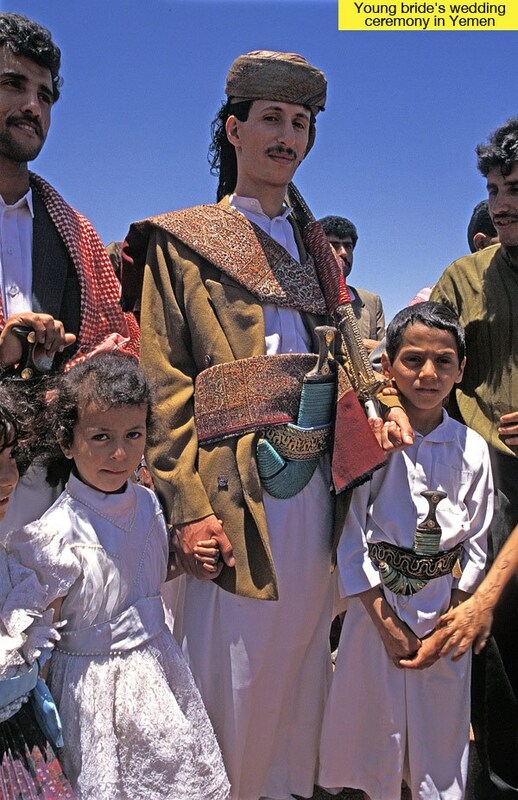 Yemen once set 15 as the minimum age for marriage, but parliament annulled that law in the 1990s, saying parents should decide when a daughter marries.